The Unicode Blog: Gold Sponsor dtSearch Corp.
dtSearch Corp.'s sponsorship directly funds the work of the Unicode Consortium in enabling modern software and computing systems to support the widest range of human languages. There are approximately 7,000 living human languages. Fewer than 100 of these languages are well-supported on computers, mobile phones, and other devices. AAC donations are used to improve support for digitally disadvantaged languages, and to help preserve the world’s linguistic heritage. dtSearch Corp. appreciates the critical role that the Unicode Standard has played in making search possible across so many of the world's languages. 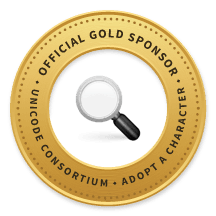 The recent Adopt-a-Character grants to support encoding Mayan Script and Egyptian Hieroglyphs demonstrate how the Unicode Consortium's continuing efforts further the preservation and sharing of human knowledge. — dtSearch Corp. 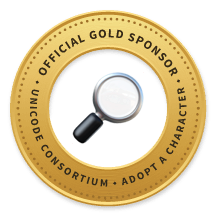 The Unicode Consortium thanks dtSearch Corp. for their support!